Last year Microsoft’s search engine platform ‘Bing’ reached an important landmark: they now control 20% of the search engine market. That’s right, 1 out of every 5 people online use Bing to search the web. Who woulda’ thought? That’s a decent piece of the search engine pie. So, use it or not, you should make sure your business is optimized for their platform. Similar to Google+ Local, Bing has been working hard to develop a more personal and relevant experience for people searching locally for products and services, e.g. pizza, home insurance, etc. But there was a problem. People now expect search engines to provide ratings for local businesses. How else are they supposed to sort through the myriad of pizza joints to find the best cheesy-bread in town, eh? Not having years of data to fall back on (Google has been collecting reviews since 2004), Bing crafted a partnership with Yelp in mid 2012 to provide user reviews for their local search. Bing-o! They are now an instant player in the growing local search market. This also reinforces the importance of being diversified online across multiple search engines, review sites, and social media. At the end of the day it’s all interconnected. 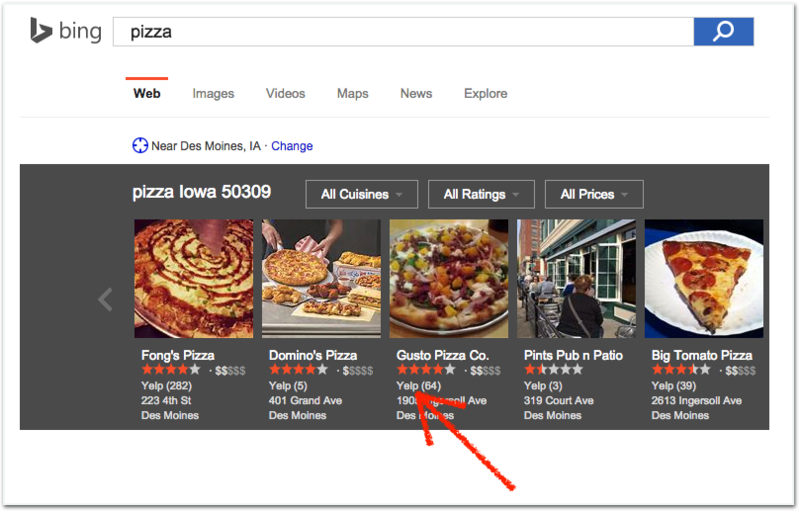 In attempt to get my hands on some of that decadent cheesy-bread I ran a search for ‘pizza’ in Des Moines using the Bing search engine. Notice how local businesses are listed smack dab at the top of the screen. Reviews courtesy of Yelp. Looks like I’ll be steering clear of Pints Pub. Now for the nuts and bolts of getting your business on Bing. Here we go! Hang onto your hat! Actually it’s rather simple. Microsoft (the creators of Bing) require that you have a general Microsoft account before you can proceed here. 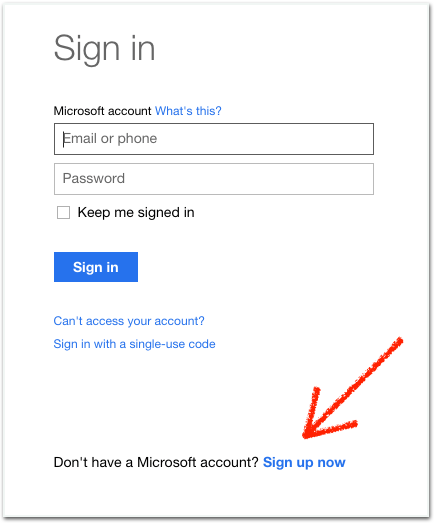 If you are using Windows 8 or later, Outlook.com, or even an Xbox, chances are you already have an account. I recommend you get an account that you use solely for your business. Sure, your Xbox account will work here, but you don’t want an unprofessional username (e.g. n00b_buster54) displaying to clients or prospects unexpectedly. Tip: Use your professional business email address to register. Click on ‘Sign up now’ at the bottom of the web browser. From this point it is pretty straight forward. Fill out their form and voila you’ve got an account. Do to the interconnectedness of the internet your business is likely already listed on Bing. If they haven’t yet recognized you as an establishment you will need to create a brand new listing. So, let’s find out if you’re on there. The best way is to go to https://www.bingplaces.com/DashBoard/Home and search for your business. 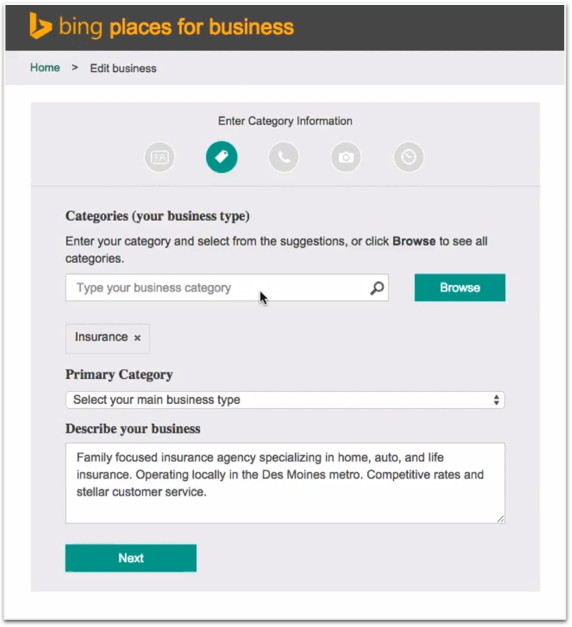 Bing will ask you to search for your business by either phone number, or business name and location. Assuming you have been consistent with the phone number you provide for your business online you can search this way. Remember that it is very important for Local SEO that you keep your Name, Address, and Phone number (NAP) consistent on all online listings. If you have both a toll-free number and a local number then use the latter. It’s better for SEO. 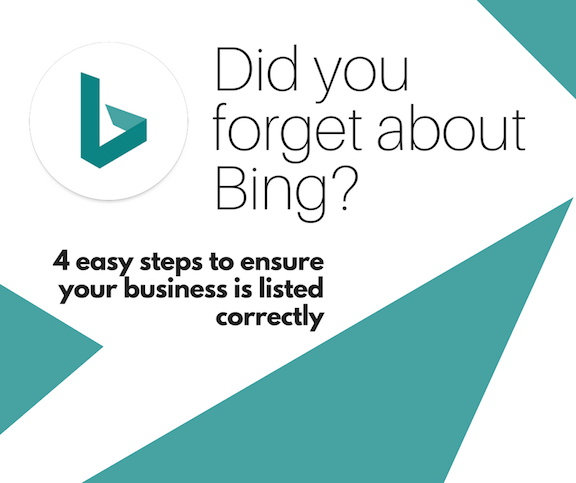 If you can’t find your business on Bing then don’t worry, you can add it yourself. This is the only step that differs from those with a listed business. If either your phone number or business name / location search were not successful there is one more thing you should do before creating a new business on Bing. There is a chance that your business listing could be recognized differently on Bing and just needs correction. Open a new tab and goto www.Bing.com and search for the name of your business and your city, e.g. ‘Jurgens Insurance Des Moines’. If your business is listed then click on ‘claim business’. Now, assuming you are nowhere to be found on Bing then you’ll need to create your listing by returning to Bing Places for Business tab and click on ‘Create New Business’. Enter your company details (NAP) and proceed to the next step. Congratulations, Bing likes you enough to take the liberty of adding your business for you. Go ahead and click on the ‘Claim business’ link next to your business profile. Bing will now ask that you verify your account, so they know you are authorized to make changes to your listing. Do this by clicking on the big ol’ ‘Verify’ button. Enter your email address and click the ‘Verify Now’ button at the bottom of the screen. Locate the email from ‘Bing Places for Business’ in your inbox and copy the Verification Pin. Hold your horses, you aren’t finished yet. Up to this point your profile is still blending in with all your competitors on the net. You want to shine, dontcha? It’s easy to update your profile, and very important. Now that you are verified click on the ‘EDIT’ link next to your business profile. You are going to brought to a window that has five different icons at the top. Each of them should be completed. Make sure your information is consistent across the internet here. Bing will ask you to set a primary and auxiliary categories for your business. At first you should list all of the categories you feel your business falls into. Many times there will be several categories in which you qualify. For example, an insurance agent might list ‘Auto & Home Insurance’, ‘Life Insurance’, and ‘Insurance’. Don’t leave anything out, but also don’t exaggerate the products and services you offer. The more specific you are the better chance you have of getting noticed. For ‘Categories (your business type)’ enter as many categories that your business fits into. Select your ‘Primary Category’ based on the suggestions given. It is very important that you select the most accurate category here as Bing will use this to decide which prospects to send your way. For the business description I suggest highlighting the products and services that you offer while mentioning your primary demographic. A personal touch here goes a long way. In other words this isn’t Comic-Con so don’t sound like R2-D2. Not much to say here except stay consistent. Have I mentioned that consistency is important yet? Also, enter your business social media profiles here. Bing will be using this number to call you to verify your profile, so be sure it is accessible to you. Pictures are an easy and intimate way for your clients and prospects to get familiar with you online. The more the merrier. Try for all 10 that Bing allows for. These shouldn’t be bland snapshots of your business exterior with a rusted out pickup resting in your driveway. Why are there so many of these out there? Your pictures should tell a story that you want to convey to your audience. Bing will ask you to provide your hours of operation. This information will be displayed to people searching for you online. So don’t skip this step. You don’t want to be like the confused shop-owner who forgot to turn his ‘Open’ sign around on Black Friday. After you’re all finished setting up your profile Bing you will click the ‘Submit’ button at the bottom of the screen. This is the final step to becoming the owner of your business profile. It will ask you to either receive a phone call or a text message with a verification code. As mentioned earlier, this phone number must be the same as you entered earlier in your contact details. If you have an automated answering system you may run into a problem with verification here. If that happens then use Bing’s online chat support and they can resolve this issue. Great article! My problem is the photos I choose for my Bing listing ( Anjeanette Photography, Peoria Az) are being distorted. I tried several different sizes, web dpi, etc etc but no matter what I choose the photos are distorted. Not good for a photography business! I have search to no avail. What IS the correct aspect ration for Bing photos on a business listing? Appreciate your help! this article still doesn’t explain how to merge reviews with the Bing places listing?? or have I missed something? ?